Can you believe it's already June? Time feels like it's slipping through my fingers and standing still all at once. It's a strange thing. But no matter, the buds of Spring make way for the bright blooms of summer. The solstice is within reach, and I'm planning on building fire all month long to honor the sun. I've had some breakthroughs in my practice lately, and these small achievements make me want to put in the work. I want to start practicing + moving + breathing + working + creating + acting + living + loving with more intention. In an effort to do so (even though Mercury is in retrograde), I'm going to try something new. Each month (or so), I'm going to focus on an intention. This month is all about BALANCE. While I generally focus on creating balance in my life, this month it's extra special, because I'm going to challenge myself to create (in the name of) balance, and share it all with you. Follow along on the blog, and on Instagram this June, and let's all cultivate a little more balance in our lives. One of the drawbacks to living in a small space: NO STORAGE! Also, I've been trying to cut back on spending frivolously. I've really cut back on seasonal purchases - which to be honest, makes me really sad because, I just love shopping. BUT I've been trying really hard to avoid the shops, and stick with the basics that I have in my closet. It's been pretty tough, and lately I've really been feeling the itch to splurge. 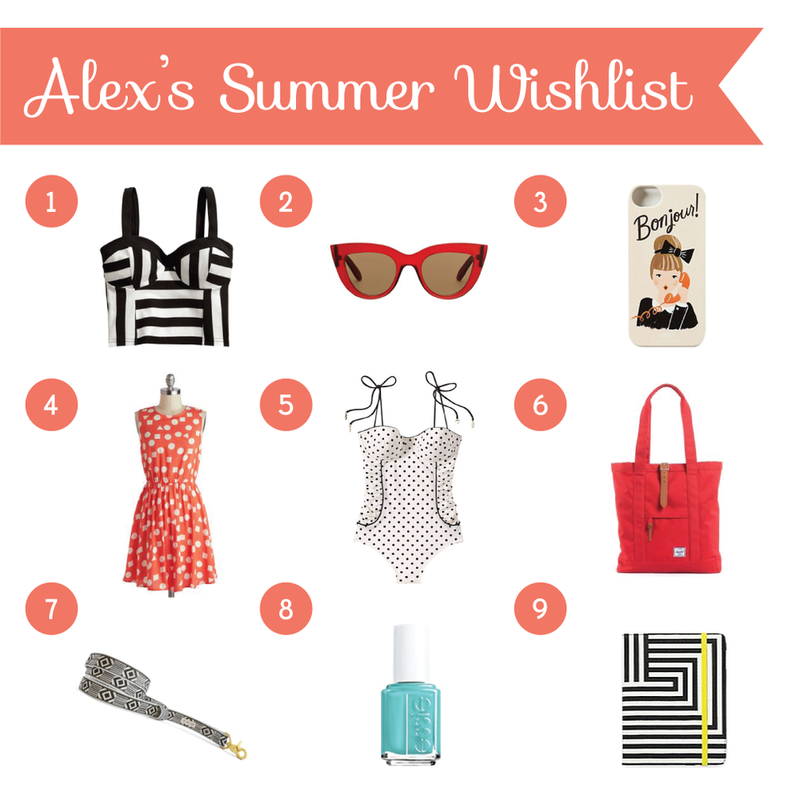 I thought instead of spending, I'd make a SUMMER WISHLIST and share it with you all. I'm really loving black and white geometrics with pops of colour! How about you guys? What fabulous finds have you been fawning over this summer?